Beware of New Poisonous Spiders In the United States-Fiction! - Truth or Fiction? Beware of New Poisonous Spiders In the United States–Fiction! There are two major versions of this circulating. Both quote an alleged article from the Journal of the United Medical Association about people mysteriously dying then investigators finding deadly spiders from foreign lands living under toilet seats. One version says the spider is from South American and was found to be hiding under toilet seats in a restaurant at Chicago’s Blare airport. Another version says the spiders are appearing in North Florida, traced to a restaurant, and have come aboard airplanes from India. …There is no “Blare” airport in Chicago. …The reference to the “Civil Aeronautics Board” will spark memories for old-timers. It hasn’t existed since 1984. …There are no reports of such spiders under toilet seats in either Illinois or Florida. Rick Vetter of the department of Entomology at the University of California at Riverside says he’s had correspondence with a man who claims to be the originator of this hoax. The man said he created an email loaded with misinformation just to prove the point that people would circulate it without checking out the facts. There is a newer version of the hoax (listed below) that includes some of the same information as the first one, such as the non-existent “United Medical Association, but uses the name of an actual spider, the “Two Striped Telamonia,” which is not a very dangerous arachnid. 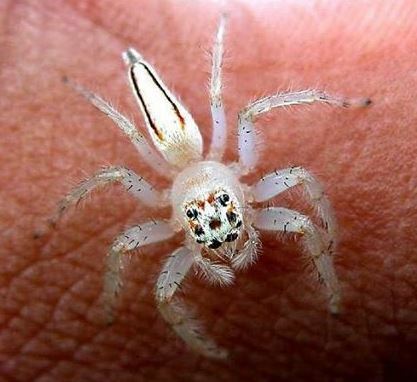 The spider in the photo of the sample below was correctly identified as a two-striped jumper, or Telamonia dimidiata, but it is non-venomous. According to an article by Dr. Beverly Clark, in the Journal of the United Medical Association (JUMA), the mystery behind a recent spate of deaths has been solved. If you haven’t already heard about it in the news, here is what happened. 3 women in Chicago, turned up at hospitals over a 5 day period, all with the same symptoms. Fever, chills, and vomiting, followed by muscular collapse, paralysis, and finally, death. There were no outward signs of trauma. Autopsy results showed toxicity in the blood. These women did not know each other, and seemed to have nothing in common. It was discovered, however, that they had all visited the same restaurant (Big Chappies, at Blare Airport), within days of their deaths. The health department descended on the restaurant, shutting it down. The food, water, and air conditioning were all inspected and tested, to no avail. The big break came when a waitress at the restaurant was rushed to the hospital with similar symptoms. She told doctors that she had been on vacation, and had only went to the restaurant to pick up her check. She did not eat or drink while she was there, but had used the restroom. That is when one toxicologist, remembering an article he had read, drove out to the restaurant, went into the restroom, and lifted the toilet seat. Under the seat, out of normal view, was small spider. The spider was captured and brought back to the lab, where it was determined to be the South American Blush Spider (arachnius gluteus), so named because of its reddened flesh color. This spider’s venom is extremely toxic, but can take several days to take effect. They live in cold, dark, damp, climates, and toilet rims provide just the right atmosphere. Several days later a lawyer from Los Angeles showed up at a hospital emergency room. Before his death, he told the doctor, that he had been away on business, had taken a flight from New York, changing planes in Chicago, before returning home. He did not visit Big Chappies while there. He did, as did all of the other victims, have what was determined to be a puncture wound, on his right buttock. Investigators discovered that the flight he was on had originated in South America. The Civilian Aeronautics Board (CAB) ordered an immediate inspection of the toilets of all flights from South America, and discovered the Blush spider’s nests on 4 different planes! It is now believed that these spiders can be anywhere in the country. So please, before you use a public toilet, lift the seat to check for spiders. It can save your life! And please pass this on to everyone you care about. water, and air conditioning were all inspected and tested, to no avail. That is when one toxicologist, remembering an article he had read, drove out to the restaurant, went into the restroom, and lifted the toilet seat. Under the seat, out of normal view, was a small spider. The spider was captured and brought back to the lab, where it was determined to be the Two-Striped Telamonia (Telamonia dimidiata) , so named because of its reddened flesh color. This spider’s venom is extremely toxic, but can take several days to take effect. They live in cold, dark, damp, climates, and toilet rims provide just the right atmosphere. Several days later a lawyer from Jacksonville showed up at a hospital emergency room. Before his death, he told the doctor, that he had been away on business, had taken a flight from Indonesia, changing planes in Singapore,before returning home. He did not visit(Olive Garden), while there. He did, as did all of the other victims, have what was determined to be a puncture wound, on his right buttock.